Our innovative formula features key polymers, waxes and cellulose powder in a gel finish for buildable colour that never runs, smudges, crumbles or flakes. Easy to remove with warm water. The custom guitar-shaped brush will thicken, lengthen and curl for a sooty lash fringe. Aqua (Water), Acrylates Copolymer, Acrylates / Ethylhexyl Acrylate Copolymer, Cera Alba (Beeswax), Butylene Glycol, Copernicia Cerifera (Carnauba) Wax, Stearic Acid, Hydrogenated Polyisobutene, Cellulose, Tribehenin, Glyceryl Stearate SE, Cetearyl Alcohol, Sorbitan Stearate, Polysorbate 60, Alcohol Denat, Montmorillonite,Tromethamine, Phenoxyethanol, Glyceryl Behenate, Glyceryl Dibehenate, Methylglucamine, Simethicone, Laureth-21, Sodium Polyacrylate, Silica, Myristic Acid, PEG-40 Hydrogenated Castor Oil, Etylhexylglycerin, Disodium EDTA, Sodium Dehydroacetate. May contain: CI 77499 (Iron Oxides), CI 77266 (Black 2). His is my favorite mascara! I have returned to purchase it over and over. It gives great volume and length. Layers well with multiple coats (for drama) and no clumps! Lasts all day, comes off easily. Lasts through tears and damp/rainy weather. This is the one for me! I love the Rock Out & Lash Out!!! It leaves my eyelashes full, long and nicely curled. I don't need an eyelash curler! The mascara comes off easily so no tugging or pulling on the eyes. This is my ALWAYS go to mascara. When I first saw the wand on this product I had my doubts! But, oh my gosh, to my surprise this wand did it all! My lashes never looked so good! Separates, lengthens, and thickens! I think I'm in love! I was so impressed with this mascara- it manages to do a lot of things: separate, lengthen, thicken and I am regularly asked if i'm wearing falsies! Plus (I have long lower lashes) it DOES NOT TRANSFER to the skin below my eyes! A serious winner. 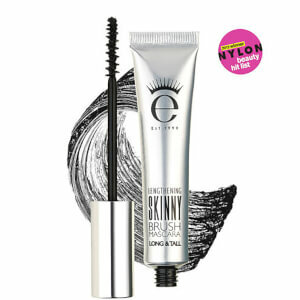 This is a wonderful mascara! Dark, non-clumpy, layers well. It is my favorite so far! This mascara is very good because it never once smudged or flaked on my face. It curled my eyelashes and made my eyes bolder than usual! I use this on my top and bottom lashes, the ball end of the brush works really well to seperate my lashes.